TheSamba.com :: Gallery - A better then the probably best oval of the world? A better then the probably best oval of the world? 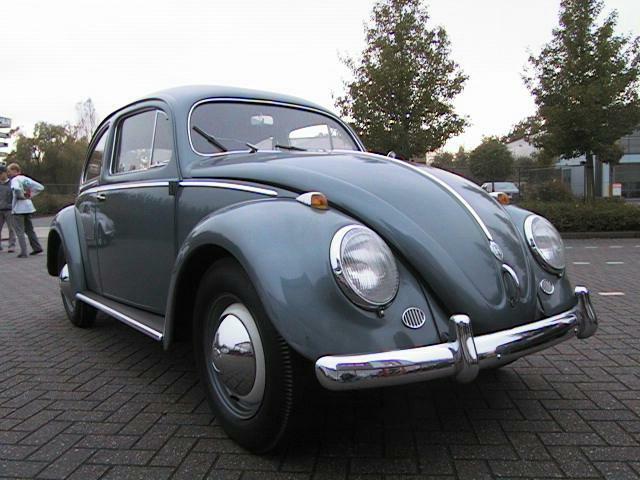 still left on the car....Here is the history; The car is drivin up to 41.000km from new in 1954 to 1976 by only one owner...at that stage it was bought back by the VW dealer near Osnabruck who sold the car new and more of it it was there First ever sold VW! So the dealer decided Not to resell the car anymore and keep it in their showrooms as their mascotte! When the dealership was sold in 1996 or 1997 the beetle became automaticly property of the new owners, who did not had great intrest in old classic Vw's and so the beetle went to storage untill the summer of this year (2001) the vintage rally driving habbit of the sons from the dealership forced the sale to raise the funds for rally purposes, at that stage the car became property from a German VW specialist-tuner who detailed the car with all the love and care, but finding out this was not his piece of VW cake it became for sale again, and was spotted by a BBT car hunter...a few days later I picked it up...guess where???? In the same town in Germany where i picked up the Black 55 a couple of months ago....the car got just enough patina to believe its original, the interior is stunning including the head liner, it drives better than any oval I ever had (the engine is a jewel! Original strap-over aircleaner etc. )and "original" means here its sits even on its first tyres!! !